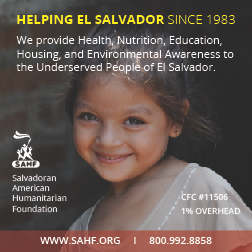 Salvadoran American Humanitarian Foundation, Inc.
We support hospitals, clinics, nursing homes and orphanages by providing medicines, medical supplies and equipment, nutritional supplements, school supplies and other staples needed for poor and malnourished children, orphans and families in El Salvador. With 343 students, Centro Escolar General Francisco Moraz?n is in San Isidro, a municipality 123 kilometers away from San Salvador. Here, a staff of 14 teaches 213 students in grades first through ninth. On Saturdays, a staff of 5 teaches 130 students on a supplementary school day. The curriculum also offers other activities like art, music class and gardening. This school lacked enough desks for students in first, second and third grade. Having no desks in these classrooms forced children to sit on broken chairs or use old and damaged tables or plastic chairs in ruins. These conditions were extremely uncomfortable for the children, who also had to share small desk tables with three other classmates. The school principal, Alcides Guevara, contacted FUSAL, SAHF's sister organization in El Salvador, asking for help. Thanks to partnerships with in-kind donors in the U.S., SAHF donated 50 student desks. According to Mr. Guevara, the new desks have motivated the children to attend school and be attentive in class because they no longer feel uncomfortable. "The need for school furniture is big here, especially in the rural areas. We can't afford to buy new desks, not even for the teachers. I dream that one day I will see all the classrooms filled with students' desks as beautiful as the ones you gave us, and that each student will have an adequate space to enjoy his classes and learn," he said. Thanks to your contribution, we have already distributed 980 school desks to 16 schools, all located in rural areas throughout El Salvador. Join us in our continued effort to enhance the quality of public education by improving the infrastructure of public schools.